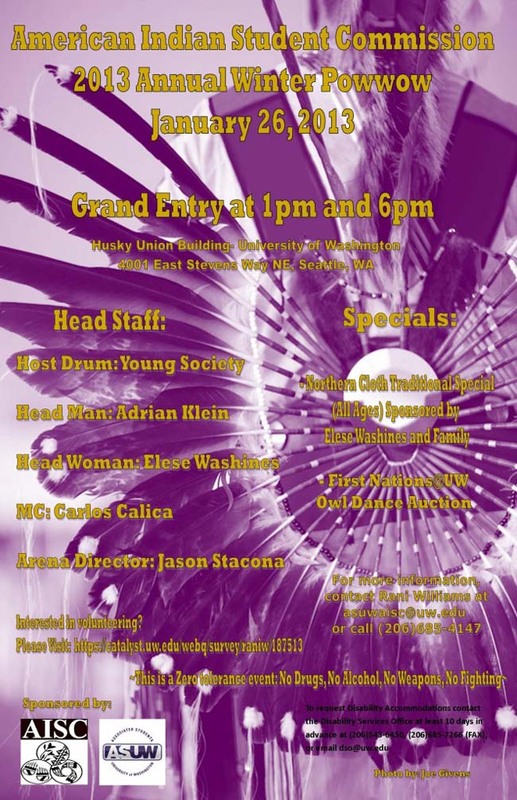 The ASUW American Indian Student Commission is hosting the annual Winter Powwow! The Winter Powwow venue will be on the University of Washington Campus in the newly renovated Husky Union Building (HUB) Ballroom. This year’s AISC Winter Powwow will be on Saturday, January 26, 2013! This is a zero tolerance event. No drugs, no alcohol, no fighting. UW Students, Faculty, Staff and the Seattle Community is welcome! Grand Entry is at 1pm! ATTN: Winter PowWow, Student Activities Office, HUB, Box 352238 Seattle, WA 98195 with payment by Cashiers Check or Money Order. Please make your cashier’s check or money order payable to the ”University of Washington”. Payment along with the sales agreement must be received by Friday, January 18, 2013, as space is limited and will be allocated as we receive payment. We have limited 10 ftx10 ft spaces available so a prompt response will help ensure your presence. Your load-in and load-out times will be included in a confirmation packet sent to you once we receive the sales agreement and payment. Publicity for the Powwow will be included with your confirmation packet. Vendor Contracts must be received by January 18, 2013 by 5:00pm. This entry was posted in Arts & Entertainment, Local News, Pow Wows and tagged ASUW AISC Winter Powwow, SEATTLE by Kim Kalliber. Bookmark the permalink.